You are here: Home / Blogging / Infolinks review 2014- Best Google AdSense companion. Infolinks review covers all the details about the program. Infolinks is one of the best in-text advertising networks. The interesting thing is that you can start making money with it without any space. But as time passed, they have added many new ad units for more monetization. It is based on certain keywords of your blog or website post. If any website user hovers on this text, it will show up an ad. It is basically a CPM network. The sign up process is quite simple and quick. When I had applied, I got approval email within 12 hours. There is no minimum traffic requirement; you just need to have unique content. Also, no objectionable content should be present. If you want to add more domains, than each of the domain have to be approved prior to be used. 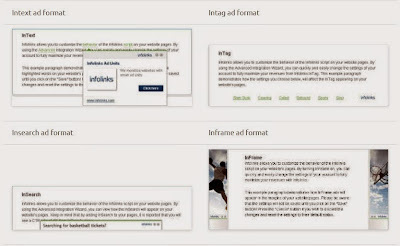 Infolinks review – Ad formats served by them. In-Text- keywords on the blog used for monetization with Infolinks will be marked by dotted lines or underline as selected by user. The ads are displayed when the user hovers the mouse over these keywords. In-Search– As the name suggests, these ads are shown only to the visitors arriving from search engines. An ad is shown is up at the bottom of the screen matching the query of the user. In-Tag– These ads are similar to the tags. They are shown at the bottom of your content, just above the comments section. You can fully customize the color and looks of these tags. Like In-Text, these ads also come up when mouse is hovered over them. In-Frame: These types of ads were added recently by Infolinks. It can be called as smart units. Most of the times, the content of the website is loaded in the middle of the page. There is empty space left at the sides of the pages. So instead of showing up white space, you can monetize these spaces with Infolinks In-frame ads. This is one of the most important questions asked by many bloggers. Most of the webmasters in the world uses Google AdSense to monetize their websites for simple reason; Google pays better than anyone else. And as far as question is concerned, yes you can safely use Infolinks ads along with AdSense. 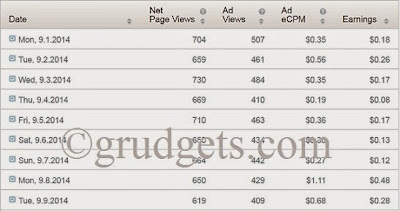 Google AdSense is CPC network, whereas Infolinks is CPM network. So, you can increase your overall earnings by using both of them together. I have tested both the networks simultaneously on many other blogs and there was hardly any effect on AdSense earnings. Note: If you have noticed carefully than AdSense link units (for instance, 728 x 15 and 468 x 15) looks quite similar to the single line tag cloud. I will highly recommend you to use any one of them when you are using AdSense and Infolinks together. For In-Text ads: You can put at the most 12 links per page for this type of ad. I had earlier used all of them. But later I realized that it is difficult to find 12 high paying keywords. So, I just reduced keywords to 3 per page and there was an increase in CPM. You can also use 6 per page, but there was hardly an increase in eCPM. Chance to double your earnings!!! It’s pretty simple! You just have to write a post describing how it helps you to monetize your content. Place the new Infolinks video in your post. You can check out the one attached below. They offer various payment options to publishers. The most common one used is PayPal. Once you have reached $50, you can request to receive payments through PayPal. Other options are eCheck/Local bank transfer, Wire transfer and Payoneer debit card. For wire transfer, the minimum threshold is $100. Local bank transfer is preferred since the amount is deposited directly to your bank account and it is available for Indian publishers as well. Only problem is that, they pay you on NET 45 basis. You have to wait for almost 60 days before you can request for payments. Overall, the program is quite god. It is compatible with Google AdSense and can be used along or as an alternative. The only con is that payment frequency is NET 45, which means you will get paid after 45 days on reaching threshold. Hope this is resolved in future!